If you work on social media, you need different content. 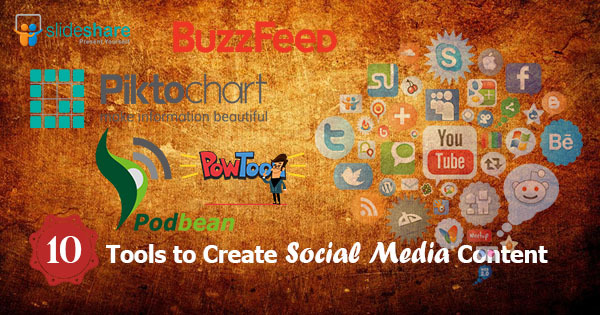 In the following article, you will be familiar with 10 tools that will help you create content for your social media. Contributing to content readers is a big thing that will play a big role in introducing your viewpoint. In that case, you can publish your content through slides,Video, Infographics, Quizzes,Podcast. Wanna be build, upload, and edit presentation and also share them on some popular social media then SlideShare is the right platform for you.Share your project on Twitter,Facebook, Google+, and of course LinkedIn.You also Embed links,Email,iframe and WordPress shortcodes in your slide.You use it by totally free of cost. With SlideBoom you will create a remarkable presentation.Using the platform you can convert your PowerPoint presentations to Flash so you can share your project in anywhere.It also helps you deliver to presentations in right audience.It has free and paid both options. Video is now the most important medium for sharing and presenting content online.YouTube is now the biggest platform for video marketing,1 billion unique users each month now in youtube.For the benefit of your business from this top online video portal,You need great video tool.PowToon is great features tool and user-friendly.By uses this tool you will make branded video and share it with customers.It’s have also paid and free options both. By using Wideo you will make your video in minutes.You can make a professional video by using this tool and share it your blog, Facebook,Twitter and Google+.If you add graphics design in while making a video you will create a more looking video.It has also free and paid versions. You also are used Magisto and WeVideo,which also help you to make a great video for share your audience. Infographics strategy boost your content spreadly.The audience more like to now prefer to learn from reading.visual content is now easy and affordable ways to stand out visually on social media. Edit and customize infographic templates easy to use by Easel.ly,You can share your new project immediately on Twitter,Facebook and Pinterest.You use the tool by totally free of cost. Piktochart gives to create interactive maps,innovative and design-intricate infographics complete with icons, images, charts.Finished the project you will be published directly to Twitter,Facebook,YouTube,Google+ and even slide presentations on SlideShare.It has free and paid versions available. Canva lets you can quickly presentation cover,infographics,flyers,social media images,online advertisements and more.and you share your works on facebook and twitter.It has also free and paid versions both. quizzes are fun and it’s more interaction readers.Quizzes give readers an inspiring to share information such as email addresses and give marketers opportunity way to collect audience information. BuzzFeed is popular quiz-sharing websites.In this site, you will easy to create, share and view quizzes.You can share your content with every device.It’s cost totally free. You also use some of the sites for quiz sharing like Playbuzz,Quizworks,Qzzr and 4screens. Audacity is open-source audio software.you will do record audio, add your own audio effects to cut,copy, and mix your own podcasts and convert tapes and records into digital recordings or CDs.Audacity is totally free cost software. Podbean lets you create and share professional podcasts in minutes without programming knowledge.You can publish your podcasts directly to Facebook, Twitter, Pinterest, Tumblr, or Instagram accounts.You can also listen for free, or upload, publish, manage, and promote your podcasts with one of Podbean’s paid plans.